President Trump fired another shot in his ongoing environmental war with California, signing a directive Friday aimed at boosting water supplies for California farmers, which in turn could come at the expense of endangered fish. 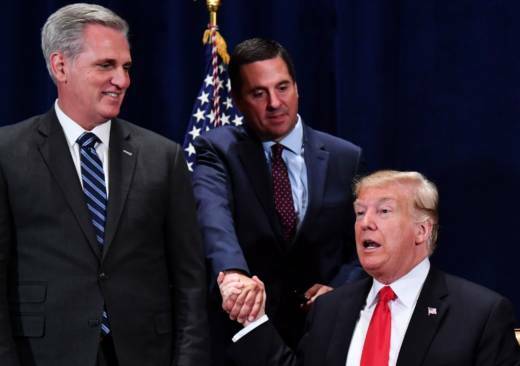 Trump was flanked at the signing by Republican congressmen from California who have long pushed for a bigger share of water for Central Valley agriculture. The memo directed agencies to “minimize unnecessary regulatory burdens," speeding up environmental reviews for water projects. It’s similar to a directive from Interior Secretary Ryan Zinke in August, ordering his staff to create a plan “maximizing” water deliveries. But in all likelihood, the president’s action will have little immediate impact, as California largely oversees water decisions within its borders. “For more than a century, dating back to the Reclamation Act of 1902, the federal government generally deferred to states on the management of water,” says Doug Obegi, an attorney with the Natural Resources Defense Council. California is in charge of its water rights system, the pecking order of who gets water first. It also mandates how much water should flow through rivers to protect water quality. Still, there is one set of environmental rules, designed to protect endangered species, that put federal wildlife agencies in the driver’s seat. These rules are the cornerstone for protecting endangered Chinook salmon and delta smelt. Known as "biological opinions," they determine how water projects should operate so that those species are not driven to extinction. Both the salmon and the delta smelt rely on the Sacramento-San Joaquin Delta, where major Sierra Nevada rivers meet San Francisco Bay. The federal rules for their protection are the focus of the most contentious California water battles, since in some years they reduce the amount of water that reaches farms and cities. And that reduces water deliveries to the Central Valley, which has spawned outcries from farming interests about large amounts of water being “wasted," even though, according to one estimate, endangered species protections only added 6.5 percent to the total amount of water flowing out of the Delta from 2011 to 2016. The Trump administration is already in the process of rewriting the biological opinions. Federal agencies have that authority because they oversee the federal Endangered Species Act. Now, the President’s memorandum sets a deadline of Jan. 31, 2019 for getting the initial review for the biological opinions done. Final opinions would be due by 135 days later. Many in the Central Valley agricultural community hope the new opinions will mean more water for farms, which in turn could mean fewer protections for endangered fish. "Today’s order by President Trump will provide welcome relief to Western farmers, cities, rural communities and wildlife refuges that have struggled under water supply rules that are long overdue for an update," the California Farm Bureau Federation said in a statement. But weaker protections for fish are likely to draw lawsuits from environmental groups. They could also put California in a tough position. That's because delta smelt and winter-run Chinook salmon are protected under California’s Endangered Species Act, or CESA, in addition to the federal law. So, when California delivers water through its State Water Project, it will have to comply with CESA and potentially keep tougher protections in place. California water, however, also flows through the federal government's Central Valley Project, which has never been bound by CESA. And legally, some say, it’s an open question about whether it would be. California or environmental groups could file a lawsuit to find out. “I think there are lots of good arguments about why they’d have to meet CESA, says Obegi. California officials said they didn’t want to speculate on the issue until the federal government releases its biological opinions. If anything, President Trump’s memorandum simply speeds up a collision with California that the state had already seen coming.